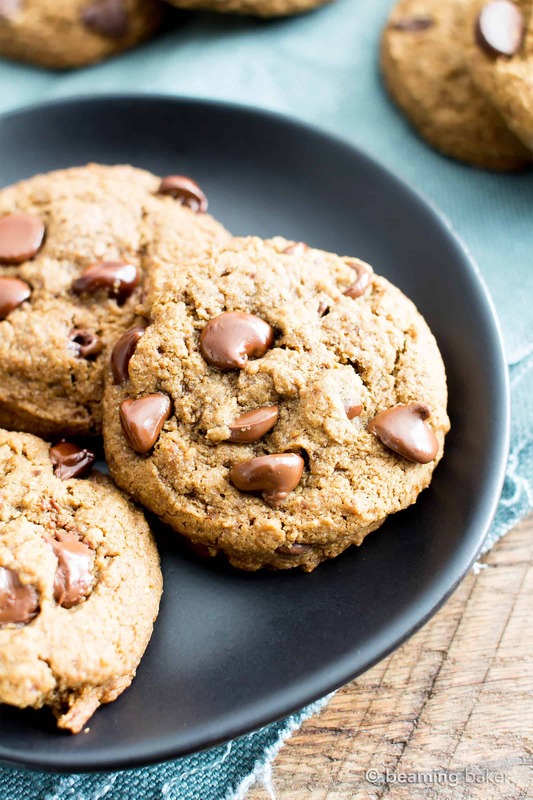 Vegan Chocolate Chip Cookies Recipe (V, GF): chewy on the inside, crispy on the edges, and packed with rich chocolate morsels, made with whole ingredients. My favorite chocolate chip cookies! Vegan, Gluten-Free, Dairy-Free, Refined Sugar-Free. Welcome, gather ’round, and get ready for some ridiculously GOOD vegan chocolate chip cookies!! ???? Why, yes, I have been waiting to use that cookie emoji for ages now. One would think I could use that all the time, but… anyway, that’s besides the point. The point today is cookies! (I know, I totally have to stop yelling that). There’s just something about a really friggin’ good cookie that gets me all pumped up. 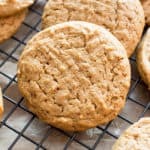 So by now you know that I’ve already shared my oat flour chocolate chip cookies, and… my oatmeal chocolate chip cookies… and and my peanut butter cookies. 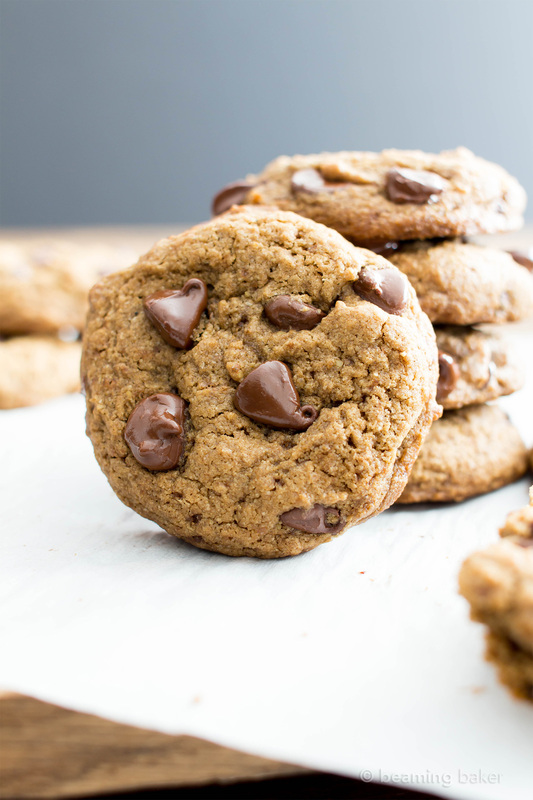 But what about the beloved, classic vegan chocolate chip cookie? Nope. And this time, I really wanted to BRING IT. This time, we’re gonna do things a little bit more indulgently, a bit more… crispy, a bit more chewy… and a bit more AWESOME. Okay, a lot more awesome. Like at least three ???????????? worth. 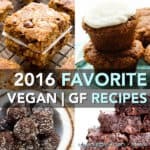 I started with my Healthier Vegan Chocolate Chip Cookies (made way back when I didn’t share exclusively gluten free recipes), then took two years of feedback from all the baked cookie recipes I’ve ever shared. Because, ya know, no bake cookie feedback really wasn’t gonna help me. 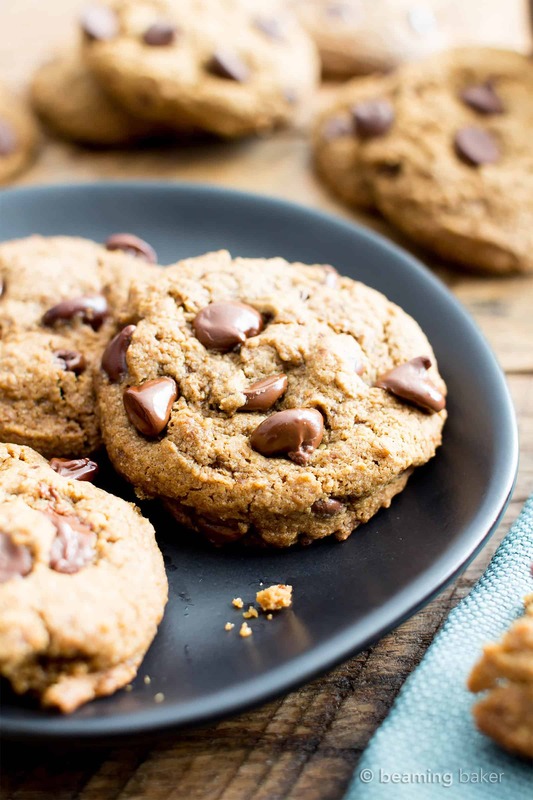 I read, tossed in my sleep so many nights over, and really took to heart, feedback on my Oat Flour Chocolate Chip Cookies, and other cookie recipes. 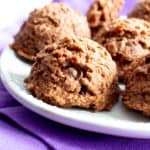 Although many of you enjoyed how soft they were, some of you wanted firmer, chewier cookies. You wanted cookies that truly resembled the junk food cookies of days past (passed?). Give them a try and you’ll see. 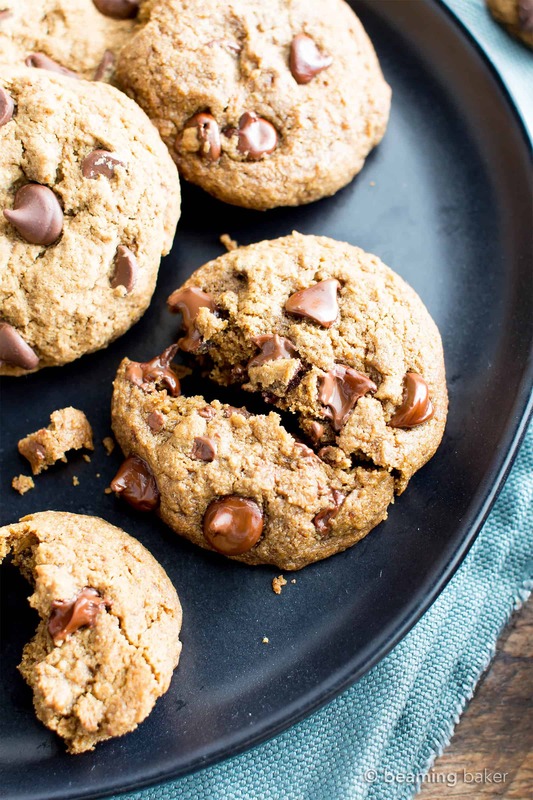 These are the yummiest vegan chocolate chip cookies you’ve ever had. Without the guilt. 😉 I seriously can’t wait to hear what you think! Thank you for making, sharing, and enjoying these recipes with me. 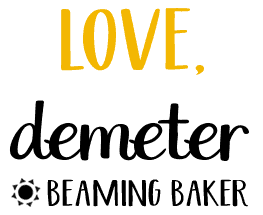 It’s truly an honor to share these baking adventures with you. 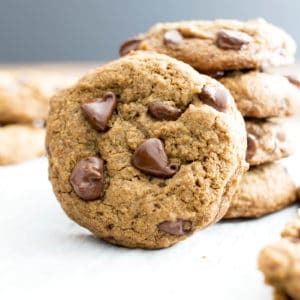 Vegan Chocolate Chip Cookies Recipe (V, GF): chewy on the inside, crispy on the edges, and packed with rich chocolate. My favorite chocolate chip cookies! Vegan, Gluten-Free, Dairy-Free. Preheat the oven to 375°F. Line a cookie sheet with parchment paper or greased foil. In a medium mixing bowl, whisk together the dry ingredients: flour, baking powder, baking soda and salt. Set aside. Add solid coconut oil* and coconut sugar to a large mixing bowl. Using a pastry cutter or fork, cut the sugar into the solid oil—this will take a few minutes. Cut until only small coconut oil clumps remain and the texture resembles clumpy wet sand. Add in the remaining wet ingredients: modified flax egg and vanilla extract. Whisk until incorporated. The mixture will be wet and chunky. Using a hand mixer, gradually add the dry ingredients into the wet ingredients bowl. Mix until well-incorporated and a cohesive dough forms. Don’t worry about the small clumps of solid coconut oil—this is expected. Fold in chocolate chips. 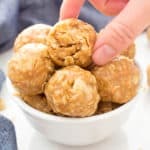 Using a 2-tablespoon cookie scoop, scoop and drop balls of cookie dough onto the prepared baking sheet. 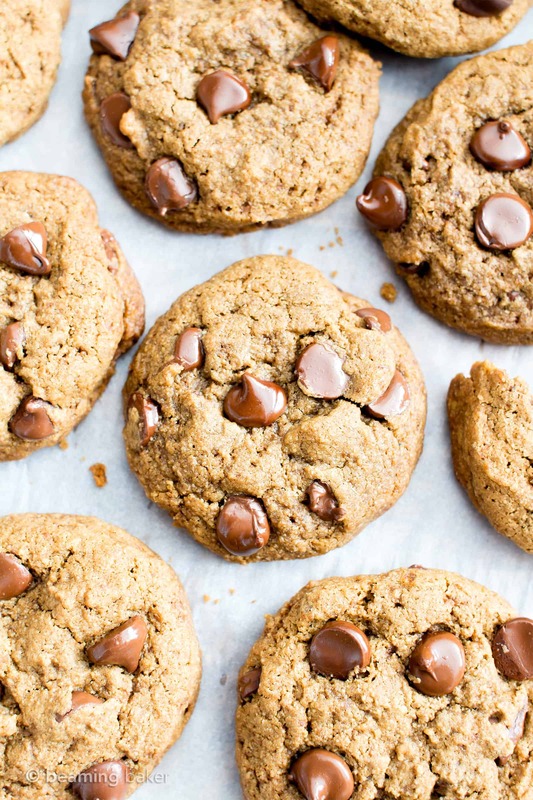 Optionally, press chocolate chips onto the top of cookies. Bake 8-12 minutes. Mine took 10 minutes. After removing from the oven, give the baking sheet a few light taps to flatten the cookies to perfection. Transfer baking sheet to a cooling rack. 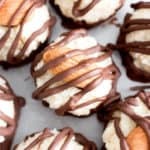 Allow cookies to cool on the baking sheet for 10 minutes. Afterward, use a heatproof spatula to transfer cookies directly onto the cooling rack for to finish cooling. Enjoy! - Adapted from my Healthier Vegan Chocolate Chip Cookies. - *Helpful hints with coconut oil: If your coconut oil is liquidy, do the following: line a small bowl with plastic wrap. Pour measured amount of coconut oil into bowl, directly over the plastic wrap—this will help you easily remove it later. 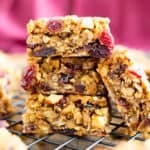 Refrigerate for 15-30 minutes. Keep a close eye on the coconut oil—you want it to be solid, but just slightly soft enough for cutting. Once it’s solid, lift the plastic wrap out of the bowl and dump the coconut oil into your mixing bowl. 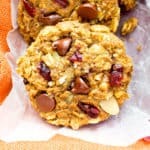 - More Gluten Free Vegan Cookie recipes: Easy Peanut Butter Cookies, 4 Ingredient No Bake Chocolate Peanut Butter Oatmeal Cookies, Gluten Free Double Chocolate Chip Oatmeal Cookies. OK, I’ve read each and every one of the above comments. I am making the cookies tomorrow (I think) but I note some say they are crispy on the outside. I would *like* them to be crispy…how do I accomplish that? Thanks for your patience…frankly, your recipes are the best I have found! I am also considering attempting to locate some vegan sugar free (Stevia?) *white* chocolate chips and do some of these with apple juice-sweetened dried cranberries IF I can figure out how to make them at least a bit crispy! Thoughts? Hi Jackie! To get these cookies crispy, make sure the coconut oil is very solid, and when you’re at Step 3, you get a wet, sand-like mixture. If not, the cookies might come out cakey. Bake it on the higher end of the bake time, and transfer directly onto the cooling rack after 10 mins (too long and they’ll get soggy). Good luck! White chocolate chips & cranberries sound amazing. Let me know how they turn out. Hugs! 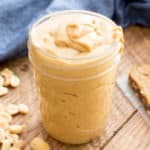 I noticed in this recipe the flax egg have equal flax and water and in all other recipes there is more water than flax to make the flax egg. 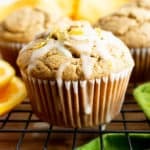 Is there an error in printing or is it just a thicker flax egg for this recipe? I don’t need these to vegan or paleo or…. Amazon hasn’t delivered my coconut oil yet but I can’t wait to make these…. I have me some good grass fed butter… can I sub? Hi Linda! I haven’t tried it with regular butter myself, so let me know how it turns out! Just made these and they turned out perfect! Thanks for such a great recipe, I will definitely be making these again in the near future. Woohoo! So happy to hear you enjoyed them Bethany! ???? Thanks for making such an awesome recipe! Just made them and they turned out perfect! I will definitely be looking for excuses to make these again in the near future. Hi, can I use this with regular sugar (I know, totally ruining the healthy vibe, but the only thing I was looking for was a no dairy no gluten cookie… I also don’t have coconut sugar… )thoughts? Hi Rachel! Haha, now worries. 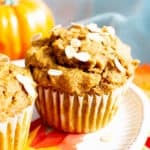 You can use white or brown sugar in this recipe. 🙂 Happy baking! Hi Louise! You could try a GF all purpose flour blend. 🙂 Happy baking!